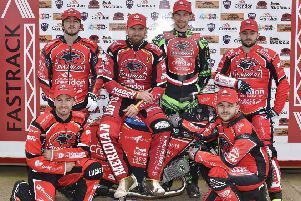 A new Peterborough Panthers era with a new promotion began in a new competition with a new track record last night (April 1), but it also came complete with a disappointing result. The city club were beaten 48-42 by Belle Vue in front of a pleasing crowd at the East of England Arena in the first-ever SGB Premiership Supporters’ Cup tie. It was a meeting dominated by the Aces’ two main men as Danish racer Kenneth Bjerre and Australian champion Max Fricke both reeled off maximums - a 15-point full house in the case of the former, who spent a large chunk of his career as a Panthers rider, and a 14+1 paid haul for the latter. Fricke can also now call himself the fastest man in Alwalton history after a sizzling 57.9-second blitz in the opening heat – a full half-a-second quicker than the previous best which was set by another visiting rider (Krzysztof Kasprzak of Coventry) all the way back in 2010. That arrived in a rather fortunate 4-2 for the Aces and provided an advantage they would never surrender as Panthers always trailed but doggedly remained in contention to force a last-heat decider in which Bjerre and Fricke slammed in a 5-1. Charles Wright was the star Panthers performer with a paid 12-point debut as he begins the new campaign in a rich vein of form following a couple of double-figures displays for his Championship club, Redcar, over the weekend. But number one Rohan Tungate and short-term signing Aaron Summers were the only other home riders to win races, while it was a night to forget for Lasse Bjerre who failed to score with two of his three rides ruined by bike troubles. Those mechanical gremlins first surfaced in heat one when the Dane, younger brother of Belle Vue star Kenneth, limped out of second place on the final lap and handed the visitors a 4-2. Their advantage was immediately stretched by a 5-1 from reserve pair Dimitri Berge and Jaimon Lidsey in heat two before Kenneth Bjerre survived some late Wright pressure to win a shared third contest. The wait for a first Panthers success of the new campaign was ended when Summers went tapes to flag in heat four and it was accompanied by a first advantage with Bradley Wilson-Dean tucking in for third spot. A series of three shared heats followed before Panthers saw their deficit double when Lidsey and Steve Worrall breezed to a 5-1 for the Aces in the eighth contest. A rapid response was essential for the hosts and it was provided by the combination of Wright’s speed and captain Hans Andersen’s savvy as they kept Berge at bay to bank a full house of their own. Further inroads briefly looked likely in heat 10 as well with Tungate leading Kenneth Bjerre early on, but the Aces man used all of his Alwalton know-how to ease past towards the end of the opening lap in a 3-3 deadlock. And Panthers were then stung by a 4-2 in heat 11 as Worrall’s late dash down the inside split the home pair of Ben Barker and Wilson-Dean. Kenneth Bjerre continued his flawless performance when holding off Tungate in a shared 12th contest and Fricke matched his team-mate’s feat of four successive victories when roaring clear following a rapid start in another deadlock in heat 13. Next came the ground-breaking penultimate race with the riders taking part selected by supporters during 15-minute Twitter polls run by each club. The Panthers followers got the result they wanted as their chosen duo of Wright and Wilson-Dean roared to a 5-1 over Worrall and Lidsey to set-up a thrilling finale. Thankfully there was no opportunity for the Aces to demand another vote! It mattered little in the end as Bjerre and Fricke weren’t about to fluff their lines as they eased clear of Andersen and Tungate to seal victory for the away side. The two clubs do battle again at the National Speedway Stadium, in Manchester, on Thursday (April 4) with Panthers then facing Wolverhampton twice next week in their remaining group fixtures. PANTHERS: Charles Wright 11+1, Rohan Tungate 9, Hans Andersen 7+3, Bradley Wilson-Dean 6+2, Aaron Summers 5+2, Ben Barker 4, Lasse Bjerre 0. BELLE VUE: Kenneth Bjerre 15, Max Fricke 14+1, Jaimon Lidsey 7+1, Dimitri Berge 6, Steve Worrall 5+1, Dan Bewley 1+1, Ricky Wells 0. 1 – Fricke (57.9), Tungate, Worrall, L. Bjerre. 2-4, 2-4. 2 – Berge (58.7), Lidsey, Barker, Summers. 1-5, 3-9. 3 – K. Bjerre (58.6), Wright, Andersen, Wells. 3-3, 6-12. 4 – Summers (59.1), Lidsey, Wilson-Dean, Bewley. 4-2, 10-14. 5 – Fricke (58.9), Wright, Andersen, Worrall. 3-3, 13-17. 6 – Tungate (59.1), Berge, Bewley, Bjerre (ret). 3-3, 16-20. 7 – K. Bjerre (59.3), Wilson-Dean, Summers, Wells. 3-3, 19-23. 8 – Lidsey (59.6), Worrall, Barker, L. Bjerre. 1-5, 20-28. 9 – Wright (59.9), Andersen, Berge, Bewley. 5-1, 25-29. 10 – K. Bjerre (59.6), Tungate, Summers, Lidsey. 3-3, 28-32. 11 – Fricke (59.9), Barker, Worrall, Wilson-Dean. 2-4, 30-36. 12 – K. Bjerre (59.7), Tungate, Wright, Berge. 3-3, 33-39. 13 – Fricke (59.4), Andersen, Wilson-Dean, Wells. 3-3, 36-42. 14 – Wright (60.1), Wilson-Dean, Worrall, Lidsey. 5-1, 41-43. 15 – K. Bjerre (60.0), Fricke, Andersen, Tungate. 1-5, 42-48.